For 24 years, Nobel Peace Prize laureate Aung San Suu Kyi has opposed Burma’s oppressive military regime and advocated for true democracy for her people—at great personal cost, including 15 years of house arrest and years of separation from her English husband and two sons. With Malaysian-Chinese actress Michelle Yeoh in the title role, Luc Besson’s The Lady illuminates the contemporary politics of this Southeast Asian country through the filter of an epic love story between the heiress of a Burmese political dynasty and an Oxford professor of Tibetan and Himalayan studies. 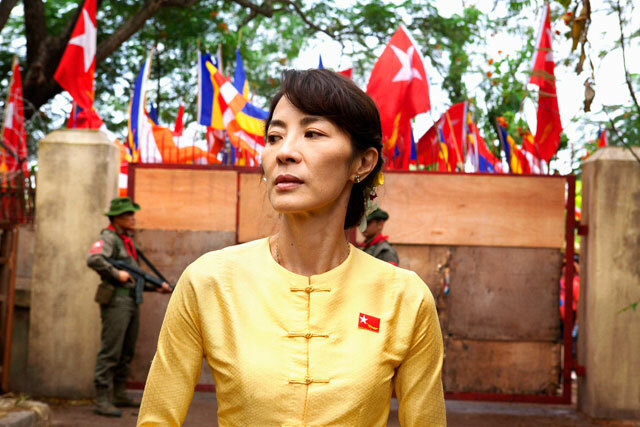 When news of her mother’s illness arrives, Suu flies to Burma, never to return, for while she’s there, pro-democracy demonstrations erupt into violence, and she’s approached to take a leadership role. Her speech to hundreds of thousands of people at a mass rally in front of Rangoon’s Shwedagon Pagoda marks the beginning of the National League for Democracy, a movement founded on the nonviolent principles of Mahatma Gandhi and the unification of Burma’s minorities. While Suu marshals support in the countryside—a montage of stunning vistas and colorful cultures, not unlike footage of celebrity Goodwill Ambassadors, that includes a dramatic showdown with a phalanx of gunmen—Michael fights the good fight at home, including lobbying for a Nobel Peace Prize for his wife. And they succeed—kind of. In the 1990 free elections—the first in 30 years—the National League for Democracy wins 392 out of 489 seats. They are never allowed to take control, however, and Suu is put under house arrest. Over the next several years, until Michael’s diagnosis with terminal prostate cancer in 1998, the Burmese junta toys with Suu’s freedom with a confusing series of occasional allowances to receive family members and call them via a phone at the British embassy. The film culminates with a Sophie’s choice: fly to England to be with her husband on his deathbed, in which case she’ll never be let back into Burma, or continue to fight for what she believes in from the isolation of house arrest. Note that at this point in time, she hasn’t seen her husband in three years. Throughout, Suu is, indeed, a lady, facing her opposition with courage and grace and elegantly tucking flowers in her hair for important events. Although not Burmese herself, Yeoh looks remarkably like her character and captures Suu’s unique quality of quiet determination, although she relies on an unnatural knuckle-biting gesture in moments of high drama. Meanwhile, Michael’s devotion to his wife is unwavering, their love cemented by their mutual dream for a democratic Burma and his unconditional support for her political priorities, despite the supreme personal sacrifices asked of them and their children. Hints at conflict in the pair are never realized. This biopic concludes in 2007, ambiguously and a little anticlimactically. Suu’s imprisonment, though, ended in November 2010, during filming, but since she still can’t leave the country, the National League for Democracy has been banned, and she is prohibited from political activities, The Lady’s aim to raise awareness remains. Ambitious and slightly lengthy, the film presents a sequence of events that, though in hindsight a bit of a muddle, leaves an unforgettable impression of a fascinating couple.